Similarity comes in handy in proving a number of neat geometry properties, although I do not usually see it used the proofs in textbooks (the bias is clearly toward congruent triangle-based proofs). One I have already mentioned before is proving the Pythagorean theorem through similarity. 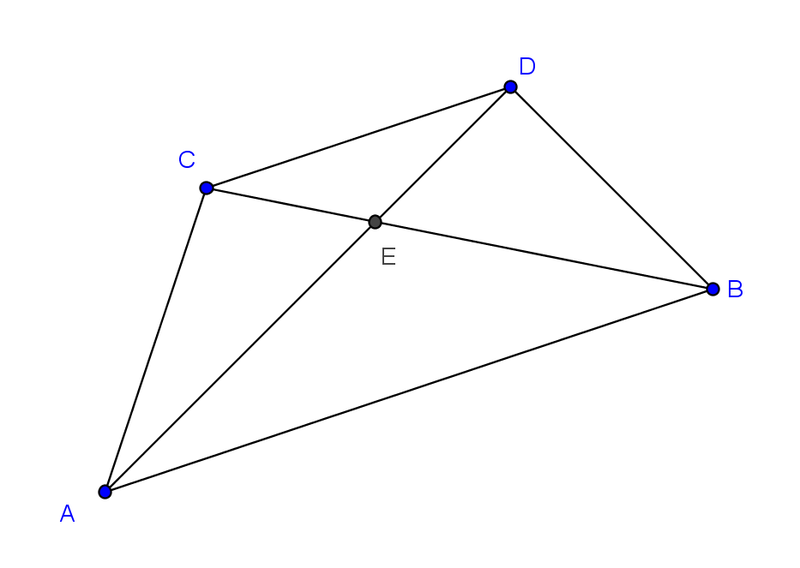 The centroid divides the median lines of a triangle in a 1:2 ratio. How to prove it? The easiest way is to start with a trapezoid. Point C is the midpoint of side AF, and point D is the midpoint of BF. 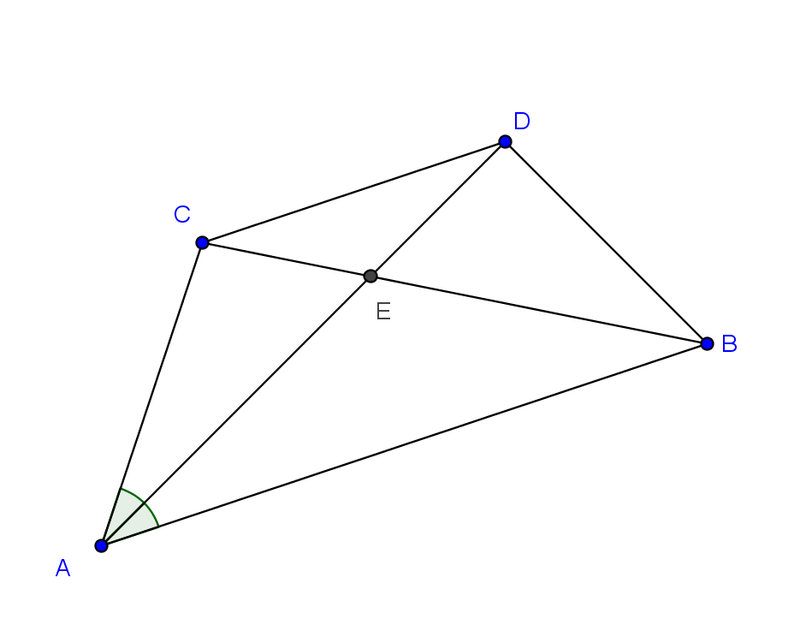 Therefore, segments MC and AD are medians, and point E is the centroid. Segment CD is a midsegment of triangle ABF, which means we know it is half the length of segment AB. In this diagram, we know triangles CDE and BAE are similar -- and by the midsegment theorem, we know the ratio is 1:2. Now we can show that segment CE is half the length of BE, and segment DE is half the length of AE. We have our proof of the centroid property. The angle bisector property is another easy one to prove with similarity. Here is another trapezoid, with side AB is parallel to side CD, and where angle BAC is bisected by segment AD. We know angles ADC and DAB are congruent by the alternate interior angles theorem, which means ADC and DAC must be congruent as well. This shows us that triangle ADC is isosceles, with segments AC and DC being congruent. Furthermore, as in the problem before, we know that triangles CDE and BAE are similar. Therefore, we can say that DC/CE=AB/BE, and since we know AC = DC, we know that AC/CE=AB/BE. There is our proof of the angle bisector theorem. 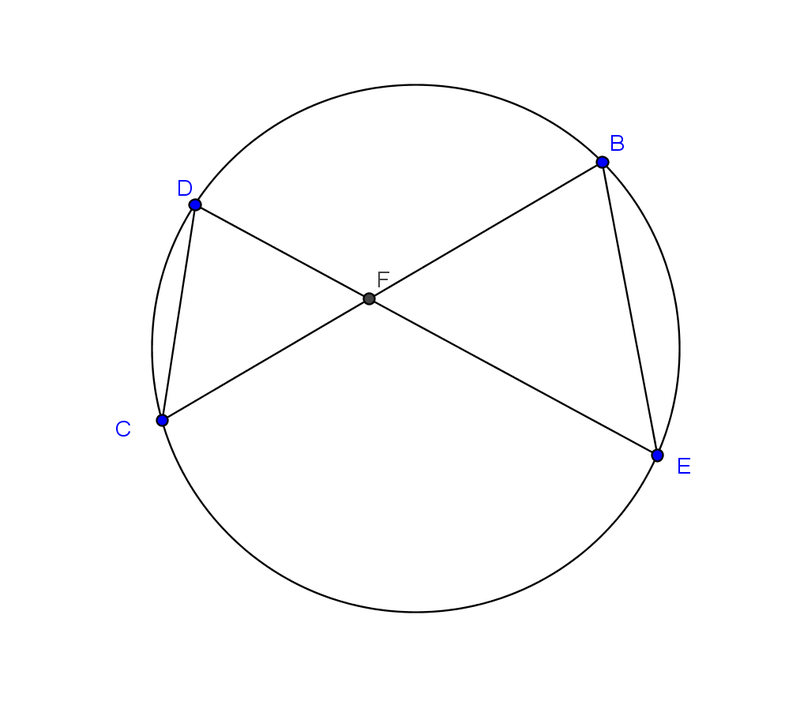 F, the point of intersection of chords DE and BC, is not the center of the circle. Because inscribed angles CDE and CBE both intercept the same arc CE, these angles must be congruent. Angles CFD and EFB are congruent vertical angles, so this means triangles CDF and EBF and similar by the angle-angle similarity theorem. This sets up the useful proportion that CF/DF = EF/BF. 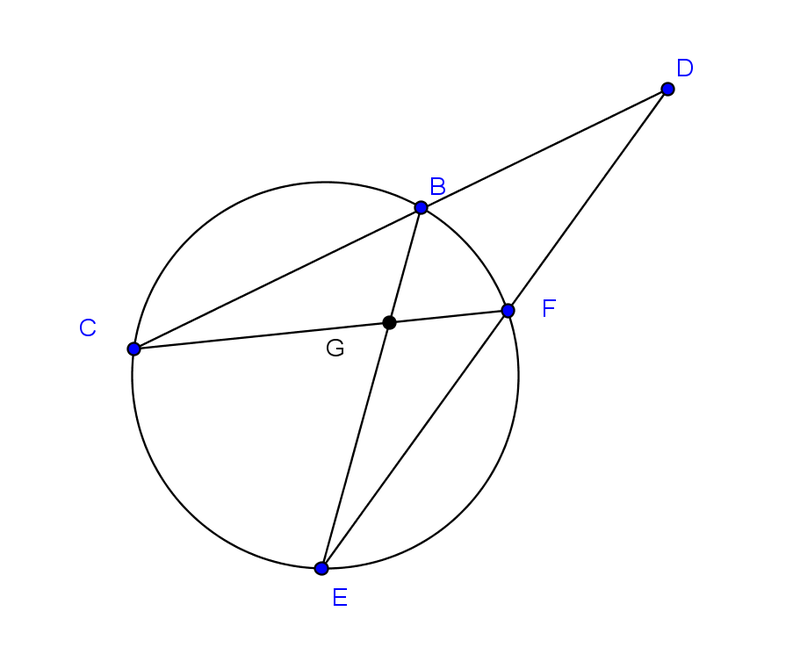 Like before, G is not the center of the circle. Because inscribed angles BCF and FEB both intercept the same arc FB, they are congruent. 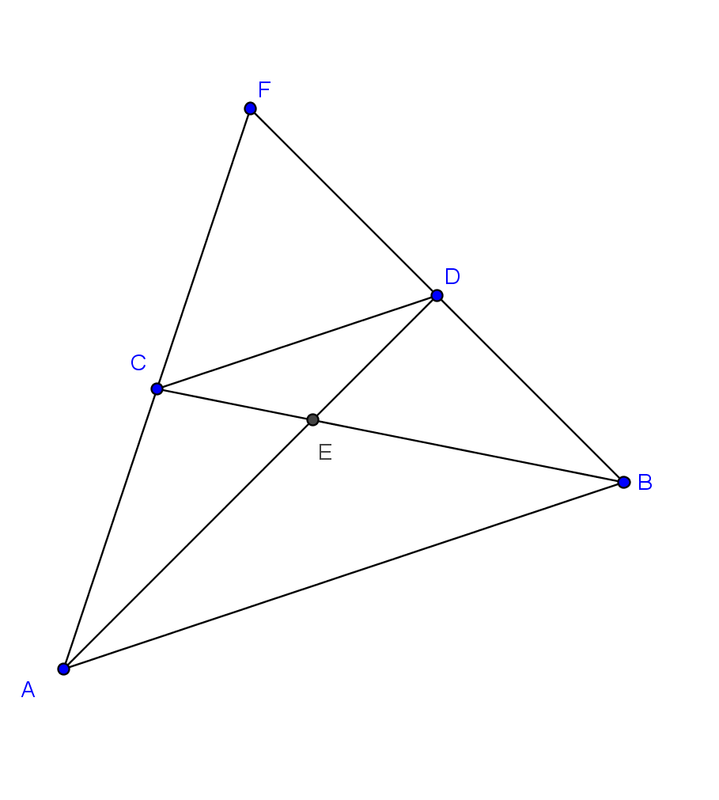 Although with the common angle BDF, we can show that triangles CDF and EDB are similar by angle-angle similarity. This sets up the useful proportion that BD/ED = FD/CD. A line with a slope of 1/7 passes through (12, 2). What is the y-intercept? 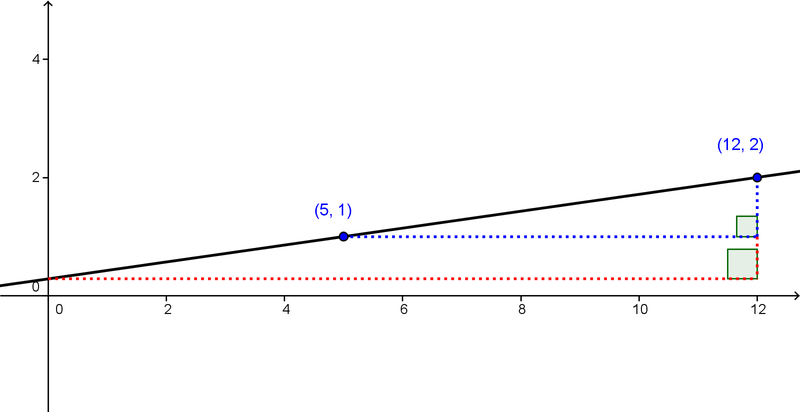 The blue triangle has a slope of 1/7, and it is similar to the red triangle, of course. The proportion 12/7 = y/1 will find the height of the red triangle, y. Therefore, the y-intercept is 2 - y.